Proper positioning during physical therapy is often crucial to the success of the procedure. 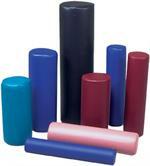 Our selection of therapy bolsters, wedges, and other positioning aids will help get your patients back on track. From naugahyde therapy bolsters to crescent and knee wedge pillows, we have the essential patient positioning products that your practice needs. Our Bolster pillows are available in a wide variety of sizes, and colors. Made from synthetic leather, or Naugahyde, therapy bolsters and positioning wedges from e-current.com will provide years of heavy use in your rehabilitation center. Designed to elevate the knees and flatten the lower back, our crescent and knee wedge pillows are perfect for many different therapy exercises and examinations. With high-density urethane foam, your patients will have comfortable, sturdy support while your practitioners will be able to easily position your patients for maximum therapeutic advantage. Give your patients the support they need for recovery and rehabilitation with bolster pillows from E-Current.com today.